The home's entry hall is its business card; it shows who lives inside, who owns the residence, and the personality of the dwelling's occupants. It is important to consider your entrance, as it is the first thing guests will see when they visit your abode. But how does one impress and impart originality when the area is small or compact? 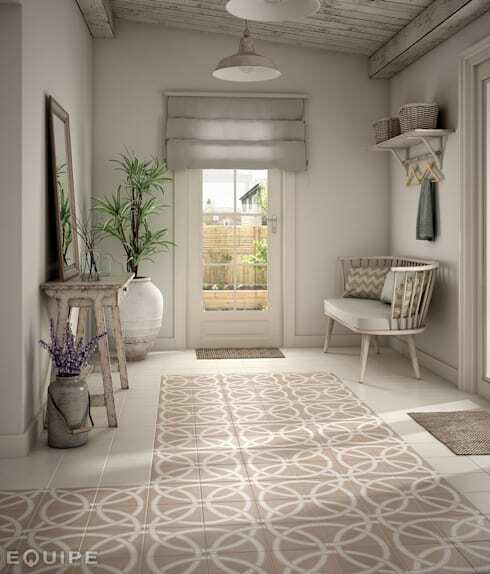 Despite the apparent lack of space it is still possible to create a stylish hallway, corridor and entrance interior. As the entranceway or foyer is an intermediary space, i.e., it is always visited in passing, the decor will depend on the shape and positioning of the area that we have. A hall that is larger won't necessarily be easier to decorate, and a small space can provide fewer options making the overall design easier. With imagination this versatile environment can allow us to decorate in many ways and with diversified styles. For today's Ideabook, we've selected eight halls and entrances that show you how you can make good use of your compact space. Read on below and get some inspiration for your home today! This entrance transports us to the halls of the best contemporary museums. 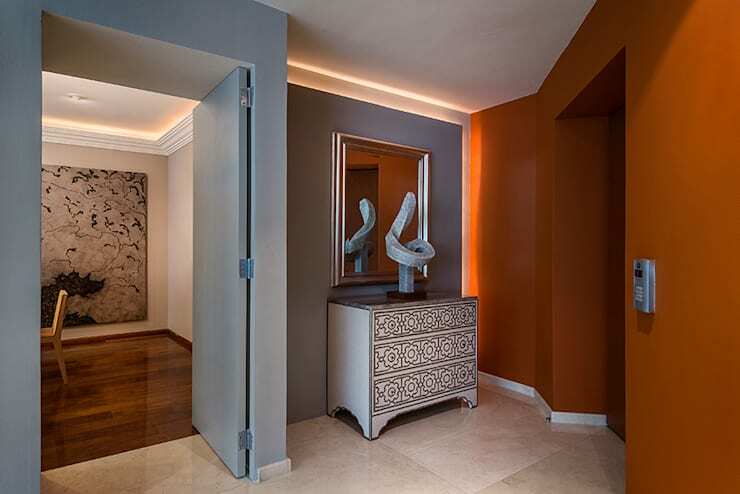 Boasting sculptural art, soft lighting and intriguing furniture, this hallway is impressive and sophisticated. Although this entry does not feature a large volume of ornaments, the pieces that have been chosen are thoughtful and considered. A decorative aesthetic focuses on the bone-inlay console and mirror upon which the sculpture stands. Relying on a combination of white, grey and timber tones, the result is a modern and elegant look. The background wall is a dusty grey-blue, while a bold terracotta wall contributes to the intimate and warm atmosphere of the space. Mediterranean style is largely based on the correct use of natural light. After all, sunlight is a key characteristic of countries that boast warmer weather. Ample illumination is linked to cosy spaces, with blue and white offering a fresh and bright maritime aesthetic. Avoid making the mistake of overloading or overfilling the room with accessories and ornamental elements as this style works well with a sense of simplicity. The hallway mirror perfectly reflects the Mediterranean style within the other sections of the space, while white furniture against the blue background creates a distinctive atmosphere. 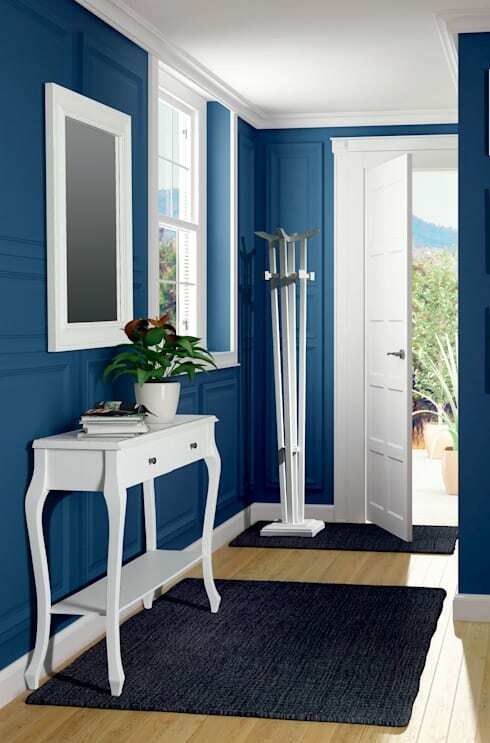 If you are working with a small entrance hall, you are going to want to reduce clutter and mess. Consider this example's neat storage system as a way to keep everything in its right place, while also looking sleek and striking. 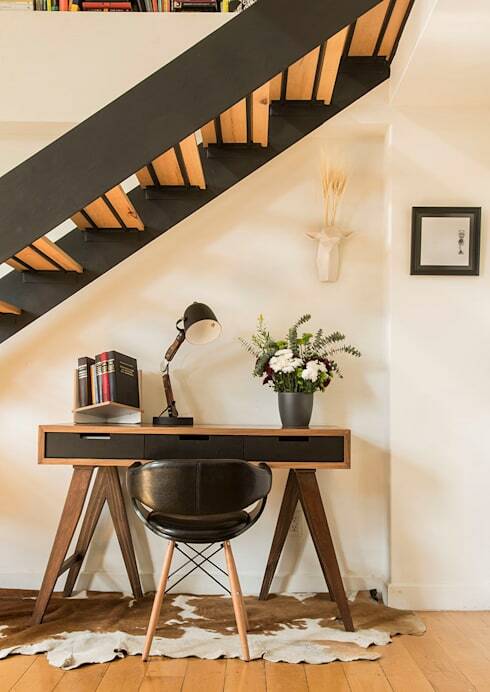 If you are looking to save space in your small hallway, while also making the area usable, why not consider a small desk? This example is fabulously practical, versatile and looks great! If you need help designing or decorating your under-stair, hallway, corridor or entrance, chat to an expert decorator via homify to get some advice. When ample natural illumination within a house isn't possible, the best solution is to use delicate and soft artificial light. Neutral shades help convey a sense of greater brightness, while appearing welcoming and hospitable. 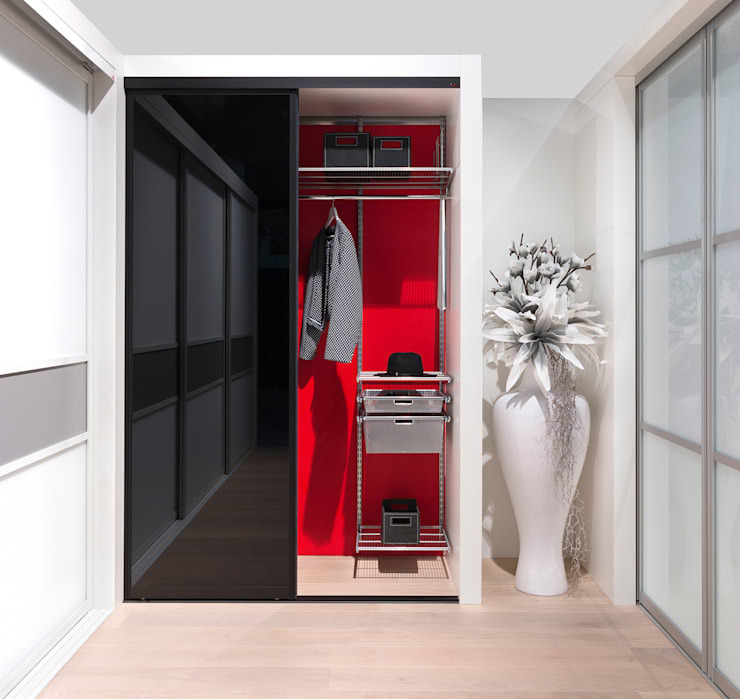 To address the lack of lighting in an entrance, hallway, or indeed any room of the house, avoid over-filling the space with accessories that do not offer a clear and necessary purpose. 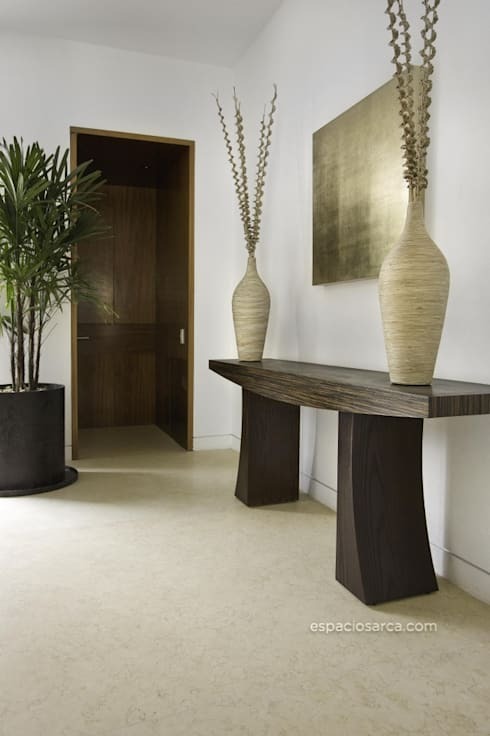 In this hall we see a modern wooden table with a contemporary rustic vibe, accompanied by imposing vases and a table featuring the same tones. Escaping the bustling city inherently instils a sense of calm and tranquillity. So why not be inspired by this bucolic dream, and use it to decorate your hall or entrance? This home immediately presents its visitor or occupant with a cool and restful setting. Here we truly adore the charming details that have been employed. These are stylishly understated without being overbearing or gaudy. Instead the decoration offers a sense of harmony and peace to the domestic environment. Patterned textiles, light walls and ample natural illumination provide this entrance a delicately individual aura. Eclectic style allows designers to implement a combination of alternate styles without having to obey specific or inflexible creative rules. However, to ensure the desired outcome is achieved, a general understanding of aesthetic sensibilities is advantageous. This hallway entrance flirts with different tonal hues and unique pieces of art, enjoying a lively environment without losing out on refinement or taste. Designed by PDV Studio di Progettazione this is a cheerful, colourful and intriguing environment. The combination of black photographs and the violet wall makes this an exciting entranceway. The standout feature is undeniably the bold sculptural pieces, offering individuality and character. Industrial style as we know it began during the late 1960s and spread into many different realms of design. Decorative materials, ornamentation and art created a more natural and raw domestic environment, exuding character and edginess. Many minimalist spaces are designed with an industrial aesthetic, adding exposed brick walls, metal detailing, framed glass and untreated timber. This interpretation is closer to a more urban design, with a beautiful hall entrance that retains the essence of industrial rigour and crispness. The walls are painted brick and the floor is finished in the ubiquitous polished concrete. 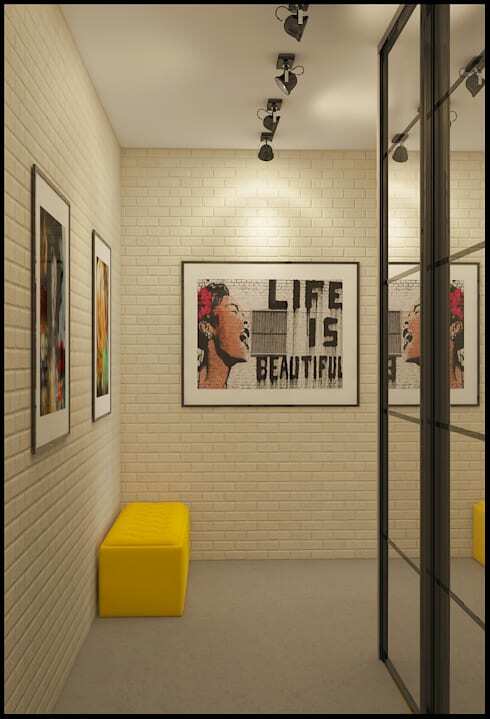 There is no shortage of artwork, with framed urban paintings offering colour and personality to the space. Do any of these entrances suit your home's style or needs? Let us know your favorite in the comments below!